Got the cardboard box from Costco. Heinz ketchup box, already cut out on two sides. About 14x14x16. Pictures taken with just sunlight. About 11am. Probably better to do it at 1pm or so. I think I could get better lighting if I used two side lamps. Maybe. Show us a picture of the box without anything in it. 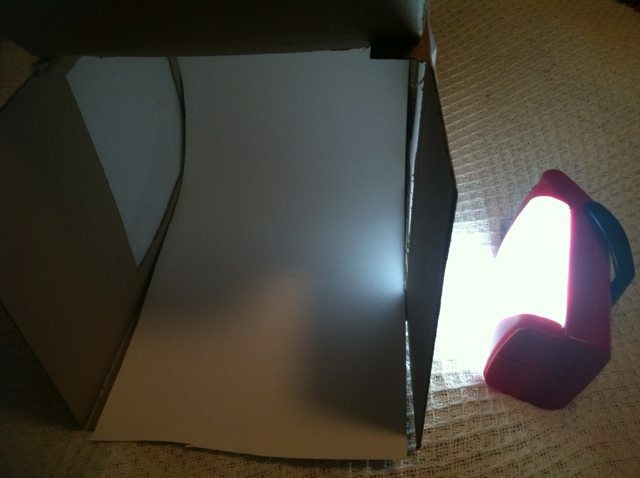 (09-14-2012, 02:45 PM)Johnny Wrote: Show us a picture of the box without anything in it. I'd like to see that too. It looks like it works quite well. It looks pretty identical minus the flaps in the front. I just removed that part. i use a similar one for my photos, out of cardboard. Great DIY project...thanks for sharing! Lee, thanks for sharing. Wow, have i been putting in a lot of work to get my shots! Hee hee. The pictures look very proffesional! I thinking of buildning one my self in the future. Do it, Matt! Mine cost me less than $5! All items found at Target. they sure pic up every imperfection and dirt/flaw etc. on 2nd look, it's time to change up my paper, it's all crumpled and dirty from all the razor and brushes and soaps that have been on it. i think i'l make it blue paper next time. Yeah, my pics are garbage. Granted, I only own a point and shoot, but for things like soap reviews and whatever I think it would help. James, i have been waiting on you lads to post your pictures on the SOTD! i really love photos and some of the gents are putting up some very nice ones, but i would love to see some more. i guess i will not make a light box just to keep challenging myself and to see what i can do with a mediocre camera, shaving instruments and the light! Hee hee. i do not want to seem to orthodox for you lads. i have to keep you guessing on what i will post next.